IBM® PowerVM® virtualization technology is a combination of hardware and software that supports and manages the virtual environments on POWER5-, POWER5+, IBM POWER6®, and IBM POWER7®-based systems. 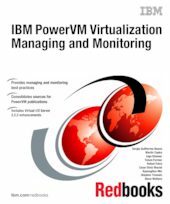 This IBM Redbooks® publication is an extension of IBM PowerVM Virtualization Introduction and Configuration, SG24-7940. It provides an organized view of best practices for managing and monitoring your PowerVM environment concerning virtualized resources managed by the Virtual I/O Server.